Pesto is one of my absolute favourite flavours! Unfortunately not many grocery stores carry already made "cheese-less" pesto... so I've created a deliciously simple recipe that uses common kitchen food items, and maximizes nutritional health benefits! One of which, is the concept of food synergy. Researchers found that pairing tomato with a healthy fat such as avocado, increases the absorption of the tomato's antioxidants! Not to mention the added benefit of the prolonged full feeling you get from this healthy green fruit! If you prefer a raw vegan diet, this dish can easily be modified to meet your needs; just skip step 3 and keep those tomatoes off the burner! Step 1: Spiralize zucchinis into noodles, breaking strands into about 20-30 cm long. 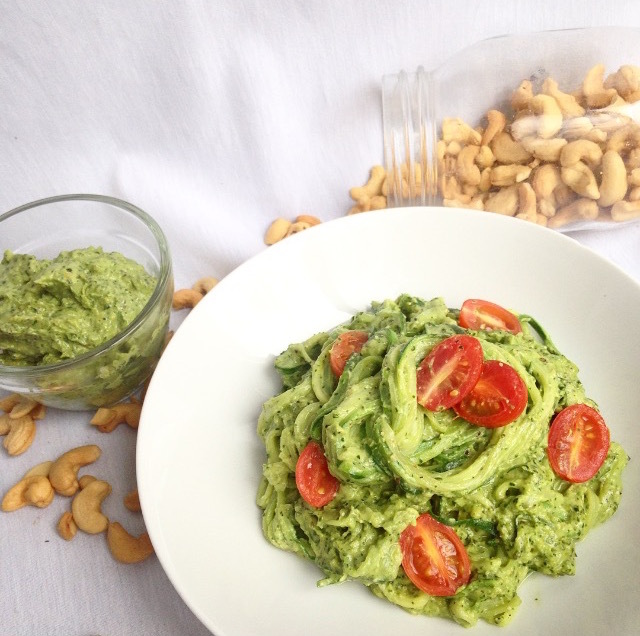 Step 2: Combine avocado, cashews, oil, and kale, in food processor and pulse until mixed. Add basil, salt, pepper, garlic, and lime juice, and blend on high until smooth. Try saving your avocado pits for a high nutrient addition to smoothies (just dehydrate, slice, and grind up into a powder)! Step 3: Lightly grease your pan, and set on medium heat. Add zucchini noodles, and let cook for 5 minutes. These noodles will hold quite a bit of moisture, so it's important not to add too much oil when greasing the pan. Also be careful not to overcook your noodles, or they will become too soft/mushy. Step 4: Strain any excess water from your pan, and empty noodles into a mixing bowl. Set tomatoes in your pan on medium to low heat while saucing the noodles. If using 3 zucchinis, add in all your pesto. If using 2 zucchinis, add in ~ 1/2 a cup of pesto (you should have ~1/3 cup leftover). Mix pesto in to fully coat noodles. Empty your hot cherry tomatoes into your pasta and enjoy! Note: Leftover pesto can be stored in a sealed container in the fridge for a few days (the avocado may cause the pesto to brown but it is still safe to eat). Try using your excess pesto to stuff mushrooms or spread on wraps or sandwiches!